The New York Islanders named Bill Guerin captain yesterday after the winger was signed to a 2-year $9 million contract last week. It was a move that nobody expected. "I'm a little surprised," Guerin told the AP yesterday at a press conference where the Islanders announced the arrivals of Mike Comrie, Ruslan Fedotenko, and Jon Sim. Guerin scored 36 goals last year splitting time between the St. Louis Blues and the San Jose Sharks. He scored only 13 goals the season before forcing many around the NHL to ask if he still had anything left. Apparently the Islanders think he has plenty left and so does he. 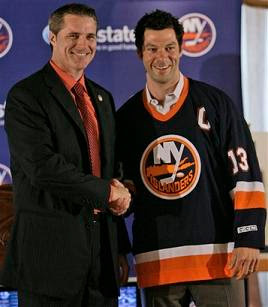 The Islanders had their team picked apart during free agency. Ryan Smyth, Jason Blake, Viktor Kozlov, and Richard Zednik all left shortly after the team parted ways with Alexei Yashin for salary cap reasons. Between those 5 players the team lost a total of 126 goals. The new players scored a total of 41 fewer goals than the players they are replacing. The Isles may add additional players to help fill that gap. They are rumored to be interested in Sheldon Souray and former Islander Michael Peca who was rumored to be going back has yet to sign with any team. The team's GM would not comment.